The Itsy Bitsy Spider Crochet: Amigurumi Workshop Series: What's in a hook? Amigurumi Workshop Series: What's in a hook? There are so many things to think about when you're beginning any crochet project, but one of the most important is your hook. If you have crocheted before, you already know that the hook can make or break your project and it's no different with amigurumi. After almost 20 years crocheting everything from baby afghans to sweaters to Christmas stockings, I've amassed a good collection of crochet hooks. In the most basic terms, a crochet hook is a metal, plastic, or wooden tool about the length of a pencil with a curved hook on one end. Of course, there are exceptions to this description, but the exceptions are hooks made for special crochet techniques. Hook sizes range from very tiny (size 14, 13, 12...) to quite large (size Q or S). Hooks with numbered sizes are typically made from steel and are used in making lace. For the most part, the hooks I use to make amigurumi are identified by a letter (A-S). If you look at the image on the left, you can see that the size of the hook itself is determined by the diameter of the barrel of the hook. 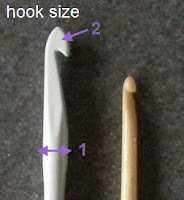 The hook on the left (size J or 6 mm) has a much wider barrel (#1) and thus, a larger hook (#2). The hook on the right is size E (3.5 mm). As you can see, the barrel is thinner and the hook is much smaller. For a great reference on the different hook sizes available, YarnStandards.com has an excellent web page. You can choose any hook material that suits you, but the most commonly available hooks are made from metal or plastic (although recently, I have also found wooden and bamboo hooks in more stores like Jo-Ann and Michael's). Metal and well-made plastic hooks have the advantage of being slick so that the yarn slides off easily. If you choose to work with plastic hooks, make sure that there is no visible seam on the barrel of the hook. This can tend to snag your yarn and make your projects look "fuzzier" than you want. Some crocheters prefer the feel of wooden or bamboo hooks to working with metal or plastic. It is true that a natural material like wood or bamboo feels warmer in your hands and has a little more flexibility than the alternatives; however, these hooks are also the kind that get better with use. One of the hooks in my collection is a gorgeous wooden tool with a carved design on the handle. It is beautiful to look at, but I've never gotten into using it because the finish on the hook is not completely smooth. As a result, the yarn I'm working with snags on the hook and makes for a lot of extra work. Granted, the finish will wear down with use, but I just don't want to wait that long. For my amigurumi projects, I prefer the soft-touch hooks by Clover. These hooks are a little more expensive, but I have found that the padded handles are welcome when it comes to making the extremely tight stitches used in amigurumi. My next workshop will cover some of the different types of yarn available and which ones work best for amigurumi. See you next time!